Hi. New to the forum. I'm having trouble with my recordings not playing back. This is with the latest update of bandicam and Dragon Age Inquisition. I also have the same trouble with Mass Effect Andromeda. Having said that today I did have a small recording play back from DAI, but none of the others. I've attached my bandicam video settings; error message; and dates that show it has worked once today. Do you have the same issue when you use VLC media player to playback the video? Also, please attach the screenshot of your format settings window. We are afraid that the recorded file has been broken for some reason. Please uninstall the graphics driver completely. If it doesn't seem to work, please record it again with the other codecs such as H264(CPU) and Xvid and check if you have the same issue. 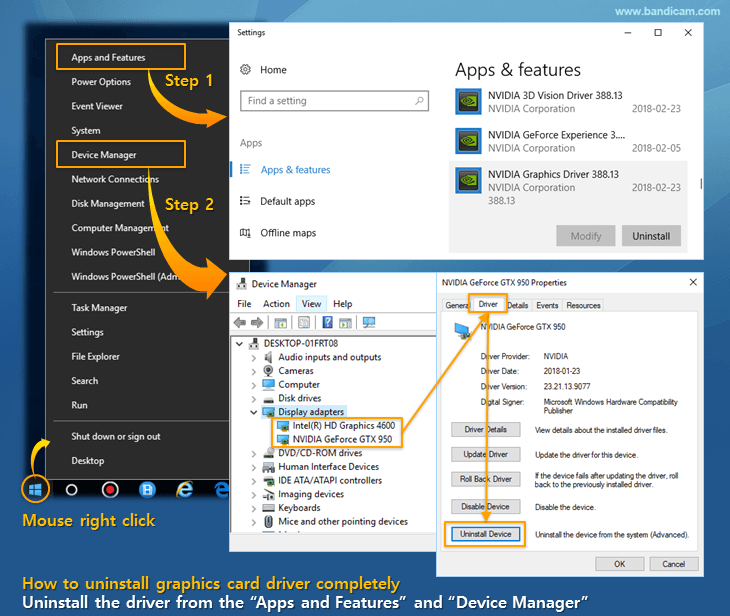 this is great thanks - but windows 10 doesn't seem to have display adapters under device manager. Anywhere else it might be? It should be under the Device Manager on Windows 10. Please attach a screenshot of the Device Manager. Please look at the image shown below carefully and follow the steps. You will find the Device Manager if you right click the Windows button. did all this and still not. recording as .avi and using bandifix didn't really work as I would record for a couple hours and would only get back about 10 minutes of video. If Bandifix fails, we don't have a good solution. thanks for all your help I really appreciate it. I'm going to send the pc to the pc doctor and see what may be lurking on my hard drive that is messing stuff up.